I'm such a sci-fi nerd. One of the things I love about it is that it takes the issues of the present -- the economy, the green movement, the growing human population -- and projects them into the future, exaggerating and then examining them. 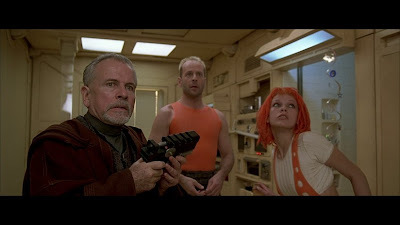 A natural solution to all three of the aforementioned issues is for people to live in teeny-tiny apartments (it saves space, resources, and is cheaper), and it's something you see often in futurist sci-fi works. One of my favorite movies has a perfect example. 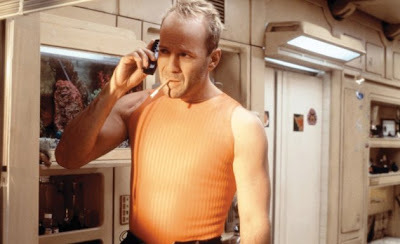 In The Fifth Element, Korbin Dallas (Bruce Willis) lives in tiny metal box in a New York super-skyscraper in the year 2214. At first glance it seems impossible to cram a full apartment into the space, but this is the future! Everything's computerized and automated: the fridge lowers into the floor to reveal a shower stacked on top of it, the TV's built into the wall, the bed slides into a cubby (and makes itself! ), and of course there are no boring ol' DOORS in the future -- there are sliding metal blast doors that slide up and down instead of outward on old-fashioned hinges. Of course, this "urban shoebox movement" is something that's already happening in places that have limited space, but that are still very desirable to live in. New York, Tokyo, London, San Francisco -- these are all places where a studio apartment seems like a spacious mansion. 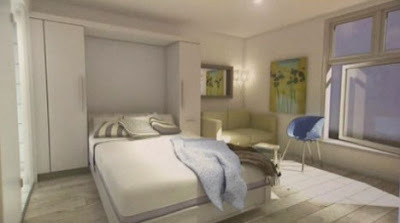 CTV, via io9, reports that a new development in Vancouver will consist of "micro-lofts," with the entire apartment contained in a 270 square-foot space. 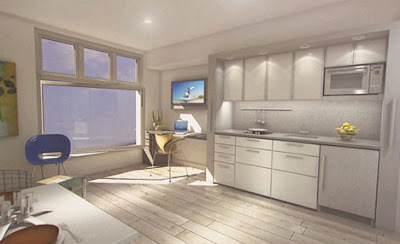 The micro-lofts feature a lot of design tricks we TAA-dwellers are already familiar with: Murphy beds, built-in shelves, galley kitchens, and flat-screen TVs. To be quite honest, I don't understand why this is getting such press. I was living in a teensy studio before it was cool! I'm just ahead of my time, I guess. Via iO9, CTV, and Core77. 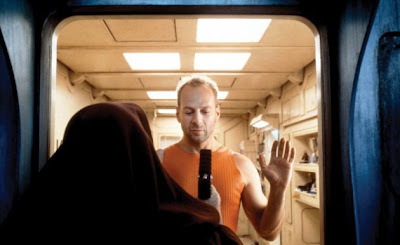 Fifth Element pictures copyright Sony and Gaumont. Even though all my apts have been various squares or L-shapes of 500-600sqft, I've always clumped my stuff together and pretty much ignored 80% of the space.